Our Rotterdam cruise port guide gives you information about the docking location, cruise dock, transportation options and much more! 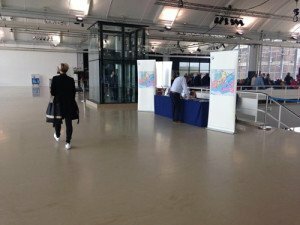 Welcome to the Rotterdam cruise port guide. Think about the Netherlands and you will probably think of canals, old warehouses and wooden shoes. Rotterdam is complete opposite. It is the 2nd largest city in the Netherlands with 625.000 inhabitants and it is like no other city in the country. Rotterdam is famous for its skyline, its port and cultural divine. It has a few of the top museums in the Netherlands, the UNESCO world heritage sights just a bus ride away and architecture to die for. Even if you would rather skip the big city and go into the countryside Rotterdams train system or water busses can take you anywhere in no time. See underneath what your options are. 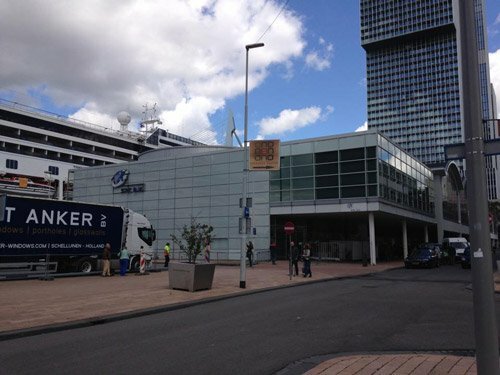 This is the cruise ship docked at the cruise terminal of Rotterdam. The cruise dock in Rotterdam lies right next to the largest sky scrapers of the Netherlands. In front of the cruise dock is a large cruise terminal with a bar, free wi-fi and tourist information. The tourist information offers great service in the cruise terminal with maps, brochures and a representative to answer all your questions. If you exit the cruise terminal and turn left you will see there is a metro and tram stop at the first crossing. See map above for its exact location. We find the tram is the best way to go in Rotterdam for practical reasons. At the crossing tram 20, 23 and 25 come by. Make sure to step into the ones saying “Centraal Station” or you’ll be heading the wrong way. Pay the driver 3 euro for a 1 hour ticket, you don’t need exact change. It’s best to take tram 23 or 25 and hop off at “Beurs” or “Stadhuis” for the city centre. The tickets you buy on the tram are more expensive. Please know you can also buy a day travel card for bus, tram and metro for 7,50 euro at any metro station. See map above for the nearest metro to the cruise terminal (300 meters away). You can already plan any journey with public transportation in and out of Rotterdam ahead of time through the following website: http://9292.nl/en This website is in English. You simply put in the adreses to figure out how to get from point A to B. 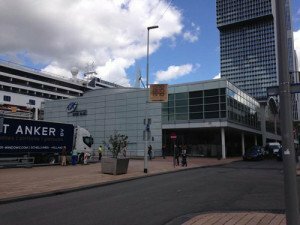 Remember that the stop at the cruise terminal is called “Wilhelminaplein, Rotterdam”. The official cabs of the Netherlands do not have a special color but always wear a taxi sign on the top. All the taxis are metered. You will find the taxis right in front of the terminal building. Underneath is an estimation of the taxi prices: From the cruise terminal to the city centre, one way: 10 euro From the cruise terminal to the central station, one way: 15 euro From the cruise terminal to Delft, one way: 55 euro From the cruise terminal to Kinderdijk, one way: 65 euro These prices are based on normal sized taxis although they usually also have small vans available. Some ships provide a shuttle and others not. When a ship is in port the tourist information is usually kind enough to provide a free shuttle service into the city centre. Ask the tourist information in the cruise terminal for details. For a unique way to discover the city of Rotterdam you can hop on the historical tram from the 30’s. You can catch in on the other side of the bridge (see map above for the exact location) and it comes by every 45 minutes. Pay the driver +/- 7 euro for a ticket. The total route takes about an hour and you can hop on and hop off whenever you want. It operates only in the summer season from 11 am to 5.30 pm. Rotterdam also has a hop on hop off bus nowadays. Find a stop at the cruise terminal. Delft is a historically unique city in the Netherlands that never disappoints. To reach it you can take tram 20, 23 or 25 (like described above) to the Central station and hop on the train to Delft. It is a simple 15 minute train ride that departs a few times per hour and will cost you about 5 euro one way. Gouda is place known throughout the world. Visit this city of cheese by train. Take tram 20, 23 or 25 (like described above) to the Central station and hop on the train to Gouda. The ride takes about 20 minutes, departs a few times per hour and will cost you about 6 euro one way. Amsterdam is the city that doesn’t need a description. A taxi to Amsterdam will cost you +/- 200 euro one way, therefore we think public transportation is a better way. One way will take about 1,5 hours and cost you +/- 17 euro. First take tram 20, 23 and 25 (as described above) to the central station and hop on an Intercity train to Amsterdam Central Station. The train departs every half hour and takes about an hour. The best way to get to the famous windmills of Kinderdijk by yourself is to go by watertaxi. Read more information about this on: http://www.waterbus.nl/kinderdijk-en/ Check the map above to see where you need to catch the waterbus. 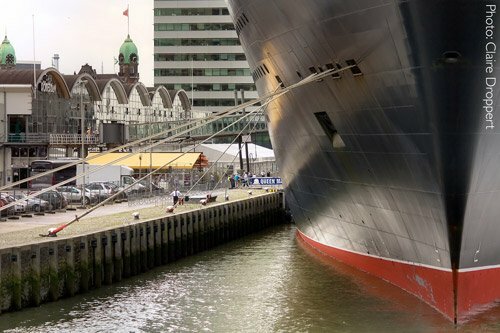 Your cruise ship will dock at Rotterdam’s cruise dock at the Wilhelmindakade. 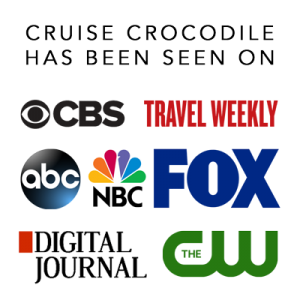 You will find a great cruise terminal here with some facilities. Read all about Rotterdam’s cruise terminal in our full cruise port guide. When your ship is docked this will be first thing to catch your attention. It connects your dock with the city centre on the other side. Cross it by foot, tram or taxi. This is Rotterdam’s newest attraction. In the city centre you will now find the largest piece of art in the world where every foodie needs to go. It is the culinary spot of Rotterdam. Find all kind of vendors here with Dutch and International specialties. The shopaholics amongst up should make sure to drop by Koopgoot. 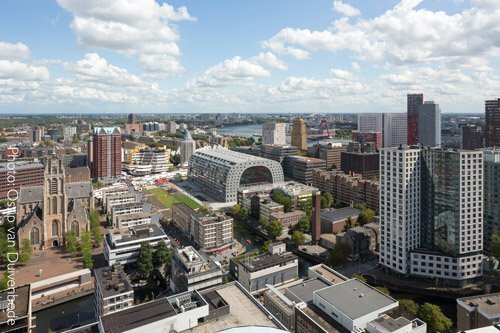 This is the largest shopping district of Rotterdam where you will find all your local specialtes and big brands. This protestant church is the only remnant of medieval Rotterdam. It was built in the 15th and 16th century and it still stands proudly today in the city centre of Rotterdam. If you are looking for the absolute Dutch landscape you simply have to visit the windmills at Kinderdijk. This UNESCO world heritage site features 19 windmills from the 18th century. Learn what the Dutch love about them and why they need them. You even have the opportunity to visit one from the inside. This sight is picture perfect where culture and history come together. Reach it by shore excursion or with the local water taxi. Rotterdam is known for its architecture and the Cubic houses are a true masterpiece. The architect Piet Blom had the idea in the 70’s to create a village of tree houses. The result is 38 cubes that appear to be this forest in the city. One of the houses are open for inside visits where you can discover the crazy way of living in one of these houses. If you take a look at a map you will see that Rotterdam is not directly located at sea. 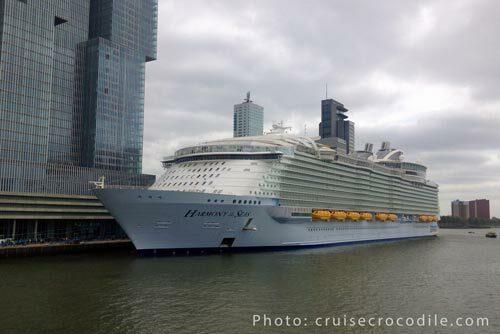 To reach the cruise terminal of Rotterdam your ship needs to sail up the New Waterway which will take +/- 3 hours. During this time you will sailing through the largest port of Europe with here and there your typical Dutch landscape. The structure you see on the picture is the Maeslandkering. This is one of the largest moving structures on earth designed to keep the lands of the Dutch dry. The Steam Ship Rotterdam was launched in 1958 and retired in 2000. She was build for the transatlantic service and became a full-time cruise ship in 1969. She is now permanently moored as a hotel and museum. Drop by for tour of the ship or a nice cup of coffee. The area around the cruise terminal in Rotterdam is quite nice. You will find museums, hotels and shops here. One of the unique buildings next to the cruise terminal is the historical Hotel New York. This is the former Holland America Line headquarters where thousands would leave their homeland to find a better life across the Atlantic. Today you’ll find a hotel inside, where they have nice coffee and typical Dutch pastry. This zoo is one of the oldest and most popular zoos in the Netherlands. Go for a nice day out and explore this large facility. At the new Rotterdam Central Station you will find quick and frequent services to Delft, Gouda and Amsterdam. If you would like to escape the busy city these 2 might be 2 great alternatives. The train takes about 15 minutes to reach Delft and departs every 10 minutes. The train to Gouda takes about 20 minutes and departs every 10 minutes. Take the metro (line D or E) or the tram (line 20, 23 or 25) to the central station. The Euromast is the eye-catcher of Rotterdam. You’ll find an observation tower 96 meter above the ground. Go for a nice dinner or prearrange to go abseiling from this iconic building.